In the first part of this two part posting we talked about supporting your cat during her pregnancy including trying to have a clear idea of her due date and how many kittens are on the way. Now we will talk about helping her through the big event itself. How do you know your cat is in labor? As we discussed in part one, towards the end of your cat’s pregnancy you should be taking her rectal temperature every day waiting for a sudden drop below 99 degrees. When labor begins, most cats pant and vocalize and may become restless and pace around like they are looking for something. You can try to make your cat comfortable where you would like her to have her kittens (you may have a box or an area already set up), but don’t force the issue. If she chooses a different location, you should just support her there. You don’t want to upset her or disrupt her labor at this point. In the second stage of labor, contractions become stronger and more visible and you may note a small amount of clear, tan or blood-tinged vaginal discharge. Note that it is perfectly normal for kittens to be born either head first or back-end first. Either way; according to Canine and Feline Reproduction, by Margaret Kustritz; once contractions are seen, a kitten should be born within four hours. If your cat’s pushing hard, a kitten should be passed within 30 minutes. Third stage labor involves the expulsion of the placenta. Again, you need to be aware. 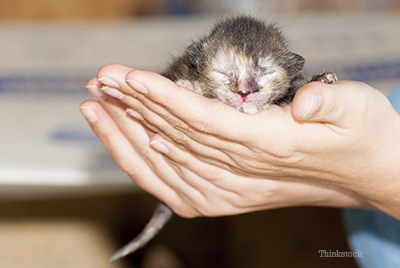 Count to be sure your cat delivers the same number of placentas as she does kittens. Then, feel free to take away the placentas and dispose of them. How do you know if there is a birth problem that requires medical intervention? Dystocia (or difficulty giving birth) can be a serious problem for both mother and kittens. Once you know how a normal birth progresses, any deviation from that norm is worthy of a phone call to your veterinarian or an emergency clinic depending on the time of day. It’s far better to contact your veterinarian and to be told that everything is okay than it is to not call and let a problem get worse. It is advisable, however, that you call someone first because it is not in your cat’s best interest to disturb her or to disrupt her delivery by rushing her off to the hospital unnecessarily. Kittens are stillborn or are alive but seem weak or not normal. The key is to be as prepared as possible. Know what to expect. Know who to call. Then hopefully everything will go well and you’ll only have to contact your veterinarian after the fact to take the new family in for a routine, wellness check. 1. Kustritz, Margaret V. Clinical Canine and Feline Reproduction: Evidence-Based Answers: Wiley-Blackwell, 2009. 1st Edition.